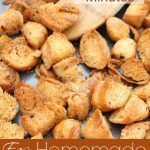 Learn how to make croutons in the oven in minutes with any kind of bread. They're so much better than store-bought! seasonings salt, pepper, parmesan, dried herbs etc. Bake on baking sheet at 350ºF for 10 minutes, gently tossing at the half-way mark.